Though I am not a big cookie eater once in a while everyone craves a good old chocolate chip cookie! Doing the Ketogenic diet one does not just drive to the store and buy a keto friendly chocolate chip cookie, at least not in the small farming community where I live. Instead you start picking up some ingredients and hit the kitchen with some ideas. I love cooking with coconut flour but in some baked products almond flour is preferable. 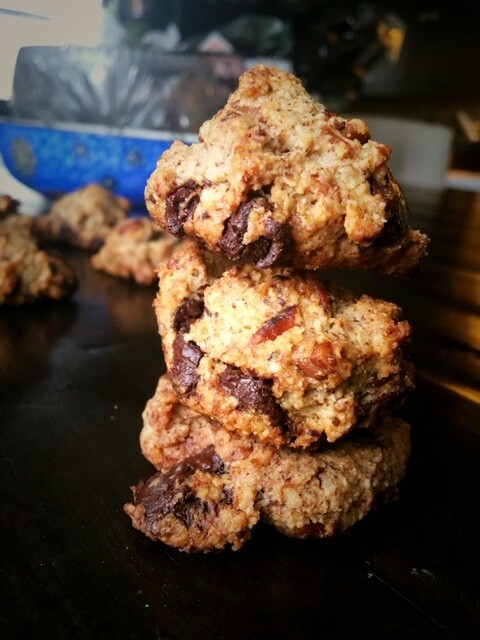 Almond flour is much easier to work with and has a nice texture which helps in creating a soft cookie that will stay together and not crumble apart, often an issue in keto friendly baked goods. Coconut flour has exceptional absorption capabilities and would make for a dry crumbly finished cookie. I have been using it successfully in crepes and buns, look for those recipes coming soon. Coconut flour makes for spectacular Keto Coconut Flour Waffles and it works well in this Keto Coconut Flour Pizza Crust. There are a few options for chocolate when your are following a Keto way of eating. Depending on how strict you are and how much you are willing to spend on chocolate will open up those options. Unsweetened Bakers Chocolate is one option and it is the most readily available in any traditional grocery store. 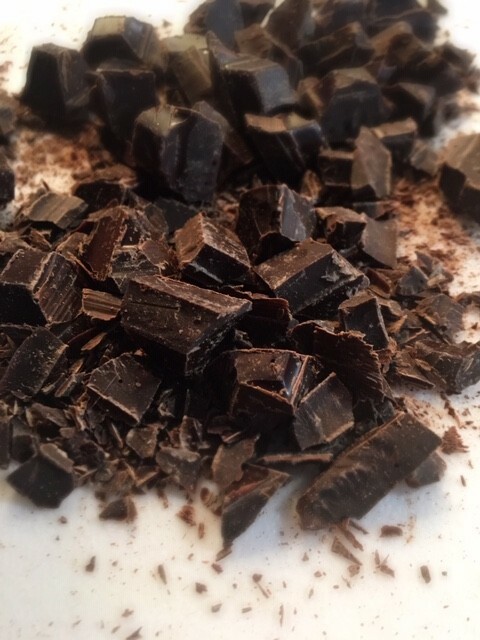 It can be bitter but once you have stopped eating sugar for an extended period of time your tolerance for dark chocolate changes immensely. What once was extremely bitter and not something you would enjoy becomes a surprising treat. You can also find a selection of dark chocolate bars in the confections isle of the grocery store. I suggest staying with at least a 70% dark chocolate but feel free to explore the various percentages. You may also see bars with Stevia listed on the wrapper, those are great sugar free options. If you are more inclined to do your shopping online then Lily’s Chocolate is a popular option made with Stevia. I find the best way to toast nuts is on the stove using a dry pan, they can quickly go from toasted to burnt so watch them closely. I know if I was to toast them in the oven I would most likely get distracted doing something else and burn them. Heat a dry pan over medium high heat for a few minutes. Add the nuts and reduce the heat to medium. Using a spatula toss the nuts frequently to toast on both sides. They will start to darken and become fragrant. Before getting too dark remove the pan from heat and pour the nuts on to a cool surface. Store in a covered container or airtight bag. I found out early on that there was just something about adding toasted pecans to a chocolate chip cookie to elevate it to the next level of amazing. We were in a mall in Waikiki and there was a Famous Amos store selling fresh baked cookies. The aroma drew us in, leaving us with no choice but to buy some cookies. They had pecans and they were some of the most amazing chocolate chip cookies I had ever eaten. I remember being surprised that the cookies had nuts and that I enjoyed them as much as I did. I was in grade 6 at the time but that memory takes me back to that mall as if I am there surrounded by the tempting aroma of fresh baked cookies. If you do not want to add the nuts feel free to double up the chocolate. In a small bowl combine the butter, sweetener, egg and flavourings, whisk until combined. 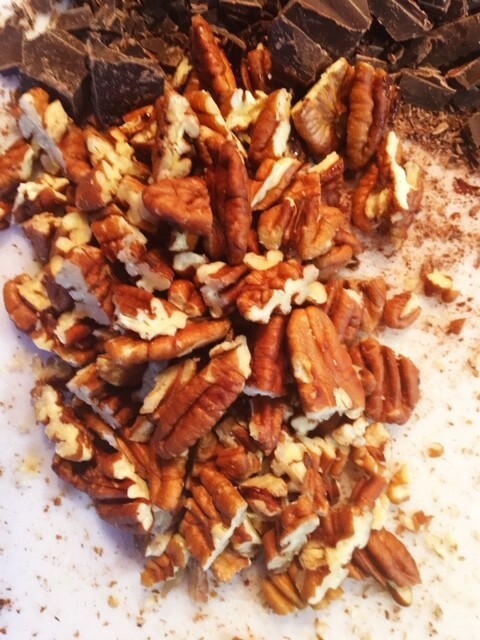 In a larger bowl combine the almond flour, chocolate and pecans. Add the liquids and stir until completely combined. Using a tablespoon scoop out your cookies onto a parchment lined baking sheet. Remove from oven and allow the cookies to cook completely on the cookie sheet. Next Post - Next post: Grow Your Own Food. Growing Radishes.